To the right is where Fort Canning Park stands....the familiar majestic entrance is where alot of couples like to take wedding shots from...the lighting of the entrance is nice, showing off the bright white contours and emphasizing the cross on top....it is almost a welcoming invitation to go into the park...which of course we did! One of a few spooky trees that we saw as we walked towards the top of the Park and sensed that the place was becoming darker and darker. Towards one of the trees, Agent MaXx spotted a possible 'leaf spirit', as one particular leaf was shaking pretty furiously from side to side, whereas the leaves beside were stale and dead. 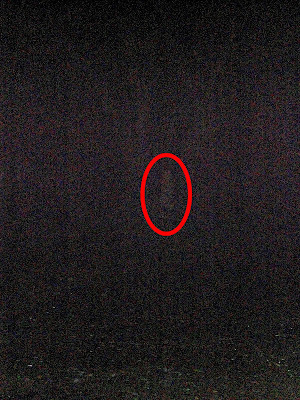 We continued to observe it from afar....we took some pictures and the pictures appeared almost dark black. 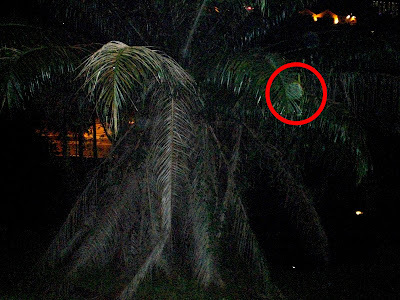 It was only after I increased its brightness when reviewing the pictures after the exploration that I noticed a whitish object that seemed to be at the spot where the shaking leaf was...We certainly didn't see any white sheets when we were observing the tree on that day itself....What could that mysterious white patch be? A ghostly figure? 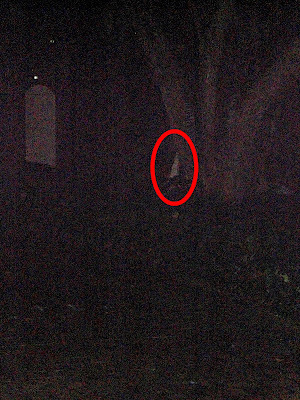 More spooky darkness and orbs within trees as we walked towards where Mount Emily Swimming Pool is located. It seems as if the environment was building up to lead us to our eventual discovery of the pool...what awaits?? Finally, we found the concrete stairs that lead to the swimming pool....and we proceeded to walk down the stairs towards the pool....The dark 'below' seems to lead us to something scary...where will it lead us to? Not being able to enter the pool by the main entrance, we tried to move along the perimeters to see if there are any other possible areas where we can enter to explore the place more...so we walked along the bushed up fence that surrounds the circumference of the pool....The fence was pretty solid, so we could only take shots of how the place looks like from outside....We noticed a white chair inside the pool. Signs that perhaps a security guard could be stationed inside. Or perhaps a life guard of the past? Unlikely, as we didn have plastic chairs back in the 1960s! We walked all the way to the other end of the swimming complex, and the only possible way to enter the swimming pool was from the wire fence....however, entering by this would be too obvious as it was still early in the night, and the security cameras that existed at the entrance may also mean that there will be cameras inside too....Being too near to the main road and having the experience of Tanglin Camp, we decided against infiltrating into this complex. We walked back up to the park ,back to our car, and from the view above, we took one last look of the swimming pool. We actually noticed that one of the pool actually had water in it. Isn't that a concern for mosquito breeding??? There is definitely no drainage and the water looks stagnant. More orbs appearing from below. From this view you can also see clearly how near Clarke Quay is, just a stone's throw away from the swimming complex. Perhaps the orbs are also having their own clubbing party?